Your loved one’s touch forever in a white gold charm. With a fingerprint so realistic you’ll think she just removed her finger from the metal. Don’t settle for less than Dimples High Definition technology to create a treasure you’ll cherish for a lifetime. Fits all standard chains and slide on bracelets, including Pandora. 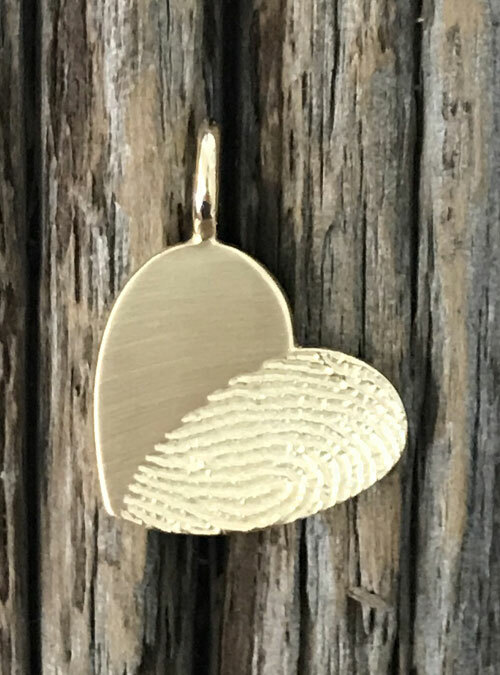 Your loved one’s fingerprint in high def on a heart shaped white gold charm approximately 19 mm in length and width (about the size of a nickel). 3. Select ‘Send me an Ink Kit and await its arrival to create a series of ink fingerprints. Take a picture of the page of prints and email it to us. 4. Use materials you have on hand and await its arrival to create a series of ink fingerprints. Take a picture of the page of prints and email it to us. Charm is approximately 19 mm in length and width. Available in sterling silver and 10K, 14K, 18K yellow, rose, and white gold.